NASA's Interior Exploration using Seismic Investigations, Geodesy and Heat Transport (InSight) lander has successfully touched down on the Red Planet after an almost seven-month, 458-million-kilometre journey from Earth. “We hit the Martian atmosphere at [19,800 kilometres per hour], and the whole sequence to touching down on the surface took only six-and-a-half minutes,” said InSight project manager Tom Hoffman at JPL. InSight will begin to collect science data within the first week after landing, though the teams will focus mainly on preparing to set InSight's instruments on the Martian ground. 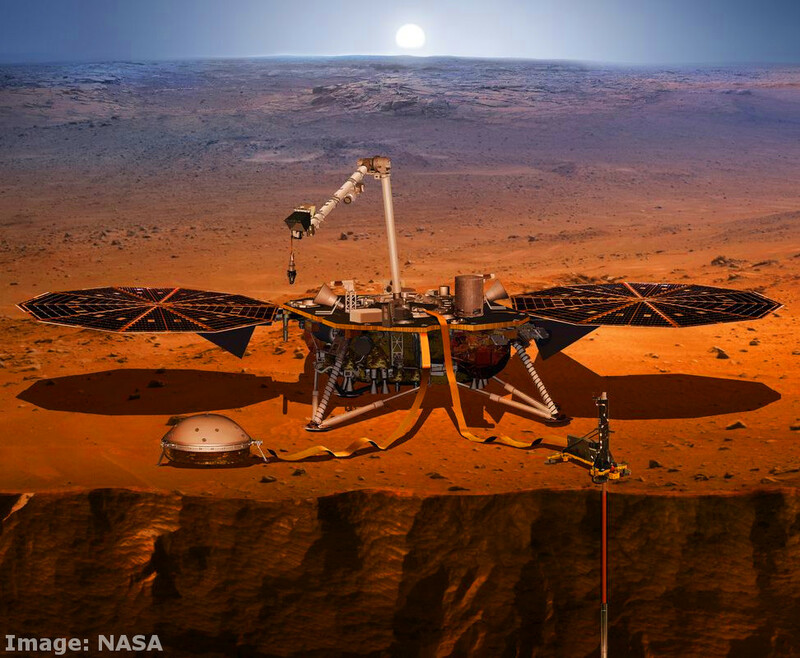 At least two days after touchdown, the engineering team will begin to deploy InSight's 1.8-metre-long robotic arm so that it can take images of the landscape. Fred Watson - Australia’s first Astronomer-at-Large in the Department of Industry, Innovation and Science - says there are a lot of questions to be answered. “You might imagine that a world without a dynamic crust of shifting tectonic plates would never have earthquakes. After all, that’s the main reason we have quakes on our own planet, as the plates slowly rub together, slide under each other, or pull apart,” he said. “As far as we can tell, though, the planet Mars has an unbroken crust without moving plates – but we believe it will still have marsquakes. “How would they be caused? Meteorite impacts, for a start, since Mars’ thin atmosphere burns up far fewer incoming space rocks than the Earth’s does. “And shrinkage of Mars’ crust, or swelling of the underlying soft rock due to convection in its interior could also cause marsquakes. “Potentially, such quakes could tell us an awful lot about the interior of the planet, as they do here on Earth. But so far, we’ve had no way of detecting them.